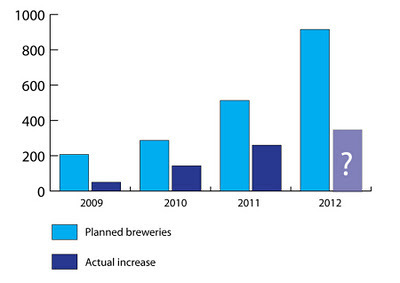 Some new numbers from the Brewers Association (BA) got me thinking again about brewery growth. I have a couple of earlier posts that investigate these trends. You can read them here and here if you haven't already. Or you can just read on. One of the things all of us have to keep in mind when looking at these numbers is they are quite fluid. The BA tracks the number of existing and planned breweries every month. As they themselves admit, brewers are far more reliable about reporting when they've opened than when they've closed. Thus, the numbers for 2011 won't be official for several weeks. The graph below is a visual version of numbers that appeared on the BA website last week (link). 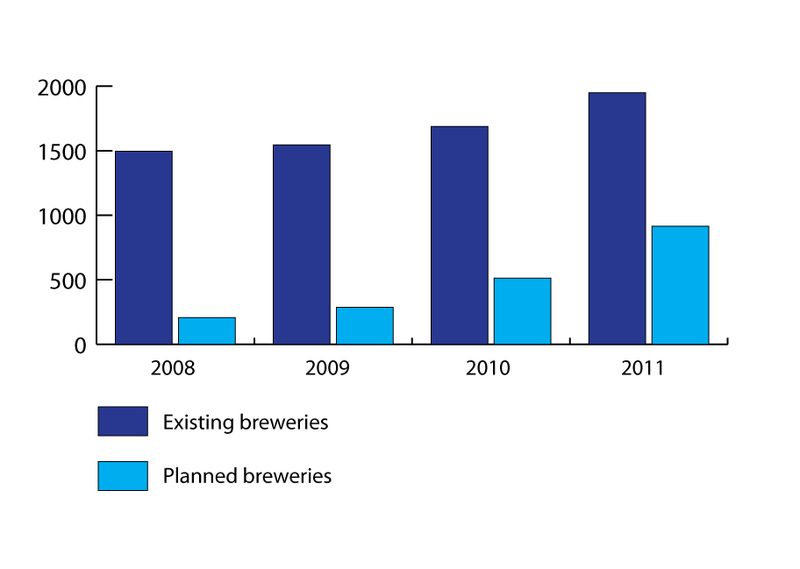 It shows the number of existing breweries and the number of planned breweries as of the end of each year. In creating a visual version of the stats, I hoped it would clarify the growth relationship between existing and planned breweries. First, note that the existing brewery count is approaching 2000 (1,949). Notice, however, that growth is not off the hook. From the end of 2008 to the end of 2011, we added about 450 breweries to the existing column. That's an average of just over 100 a year. Please remember, this is a net number. The BA gets the end-of-year number by subtracting closures from openings. So even though the number of planned new breweries rises fairly dramatically each year, the actual net increase in existing breweries shows reasonably consistent growth. I'll be interested to see what this graph looks like in a year given the fact that the number of planned breweries continues to nearly double. What's missing here? Well, it would be nice to know how many places are closing each year. Having that number would help determine the true new brewery count vs. the number planned. Planned brewery numbers fluctuate wildly. It sometimes takes a while for planned breweries to open...and some never open. Do planned breweries ever go from start-up to open in a calendar year? Inquiring minds. Time to see if the folks at the Brewers Association can help. Until I have more information, I'm going to conclude that planned brewery numbers have only a passing relationship with actual yearly growth.